Douglas Thompson, Sylvow. Eibonvale Press, 2010. Pp. 308. ISBN 9780956214775. £8.99. 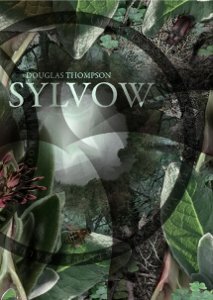 Sylvow is promoted as a literary science fiction novel that explores the modern world’s relationship with nature. The book lives up to this weighty promise and at times exceeds it, defying genre constraints. This overspill makes it a difficult book to review, not to mention a challenging read. Nevertheless, I added Douglas Thompson’s first book, Ultrameta (*) to my reading list on completion of Sylvow, as I enjoyed the author’s compelling style and would like to read more of his work. The novel is an environmental allegory set in an imaginary Northern European city. The story follows five main characters who are threatened by an ecological disaster. Leo, disillusioned with modern life, opts out and goes to live in the forest that surrounds the town of Sylvow. He believes that “Gaia”, the force of nature, will wreck revenge on the humans that have abused her planet. The forest is a magical, sentient place, not unlike Robert Holdstock’s Mythago Wood. Leo’s sister Claudia, and his abandoned wife, Vivienne, go in search of him, accompanied by a patient of Claudia’s psychiatrist husband, who remains in civilisation but is the fifth viewpoint character. The search party discovers that there is truth in Leo’s theories and that the government is conducting experiments in an attempt to communicate with the power of the forest. This novel is ambitious in scope. It is surrealist, while also dealing with complicated human relationships against the backdrop of an ecological theme. It is thoughtful, considered and raises philosophical questions about sanity and madness; the natural and constructed. The core plot—that of nature rising up against her human oppressor—is framed by magical realism, in the vein of Jonathan Carroll’s writing. The imagery is clear and vivid, written with striking detail. Sylvow has an interesting structure, taking the different points of view of all the main characters, with an interlude chapter in the middle of the book. It is nicely designed, with an attractive frontispiece and vignettes, in addition to pertinent quotes at the beginning of each chapter. The cover art is also striking. As the natural forces grow stronger the tables are turned on the people who tried to conquer and tame the environment. This wild, consuming force is also echoed in the main characters’ behaviour as they increasingly break limitations imposed on them by society and act on a more instinctive level. The characters free themselves in varying degrees, culminating with Leo, the character who has completely transcended modern life’s constraints by living in the forests that surround Sylvow. The boundaries between humans and animals collapse with horrible results. “Logically, such a time had to come for some people, when on an arbitrary whim their lives were just totally wrecked by the untrammelled forces of nature” (104). This sentence attempts to capture the ethos of the novel, however, it is the self-destructive tendencies of the characters that seemed to pose a bigger threat. The characters in the book do a good enough job of ruining their own lives, they don’t need an external force to do that for them. During the course of the novel, nature begins to win out, no longer oppressed by humans. Plant life proliferates, while the characters’ animal natures begin to take over. The idea of the balance shifting is a satisfying notion, yet it does not improve the situation of the characters or the world they live in. I would have liked to have seen the ecological changes bring equilibrium and effect some positive influence, but instead the wild influence of the natural seems to bring out the worst in the characters, while causing havoc in their environment. With the result that the plot of Sylvow sabotages what it sets out to do: it shows what chaos could ensue if nature were not controlled, adding to the argument that natural forces need to be harnessed. This novel is far from a cosy read. Thompson jolts the reader out of a sense of security by shaking up plot elements and creating characters that are unpredictable and at the mercy of their passions. Their frailty, and the frustration they feel because of it, mean that the threat of disaster comes almost as a relief, as it promises an end to their turmoil. I felt there wasn’t enough distinction between characters, particularly the personalities of the female characters Claudia and Vivienne. Their motivation was unclear and I felt they didn’t contribute enough to the plot as a whole despite being given interesting placements in the story. I would have also liked to read about Leo’s character in more depth, as his character is so instrumental to the plot. By developing his role, the plot would have also been enhanced. Sylvow contains so many ideas that at times I wanted the author to focus and develop particular aspects further—particularly Leo’s character, as he understands and embraces the force of change more than the others. I would have preferred if nature had more of a redeeming quality in this novel, instead of it deepening the dystopia. I feel the author had a real opportunity to contribute a fresh, new worldview, but instead of speculating on the potential of a world where nature is respected and heeded, at times the book reads like a treatise on the hopelessness of the human condition. However Sylvow is an interesting and diverting read, and I look forward to reading more of Thompson’s work.